A while ago I had great fun designing and making a Zen inspired garden for a client of mine (See enclosed photo). Apart from its beauty and simplicity, a garden like this is very low maintenance and requires little water. There are several types of Zen gardens, the most prominent being the dry rock type, called karesansui, literally meaning dry mountain and water gardens. A Japanese rock garden is an enclosed shallow sandpit containing sand, gravel, rocks, and occasionally grass and/or other natural elements. These gardens seek to replicate the deep calm of pristine nature in a highly stylized manner. Water is often represented with sand or pebbles; mountains with stone; and islands with masses of moss or rock material. Plants are less important (and sometimes nonexistent) in many Zen gardens. A Zen garden is said to bring tranquility and calm to our minds, helping us to relax and find inner peace. A dry rock garden is often complemented by a lush green one. 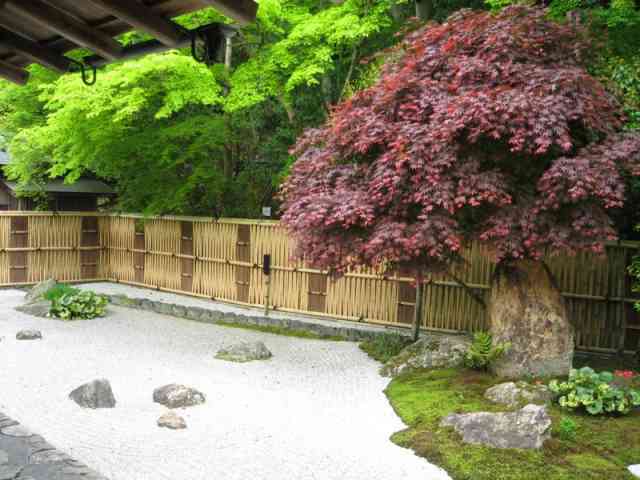 An excellent example of this type of garden can be seen at the Tenryuji Temple of Kyoto in Japan. Muso Soseki, a famous garden designer, transformed the existing garden into a Zen masterpiece with the addition of seven vertical rocks called the Dragon's Gate Waterfall. This arrangement refers to a Zen fable about fish that had the strength and willpower to swim up a waterfall. At the top, they metamorphosed into dragons. The story is supposed to inspire inner strength and discipline, central to Zen training. The power of this garden, however, emerges from its silence and ability to still the mind. One of the most famous Zen gardens is the rock garden �Ryoan-ji�, also in Kyoto, with 15 spaced rocks set on a gravel �sea�. The rocks represent islands and the gravel is raked into geometric patterns resembling waves. But the mind can also ascribe other symbolism to the scene, or none at all. 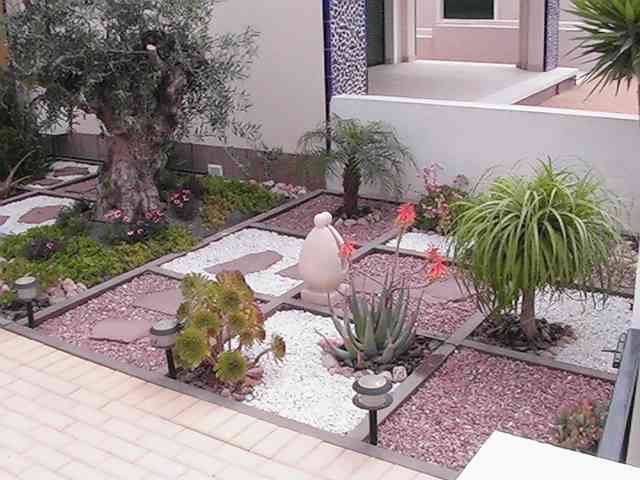 Zen garden designers will often say that there is nothing in a garden except what you bring to it yourself. It is really quite easy to make your own Zen garden. The garden does not need to be perfectly designed, just sincere. Make sure not to think too much when you arrange the stones. It is important to enjoy the making of it as much as the result. First, you should decide on size. Do you have room in your yard for a large or small patch of earth that you could convert into an oasis of sand, pebbles, rocks and possibly water? Or do you live in an apartment with no earth to call your own? Either way it can be done. 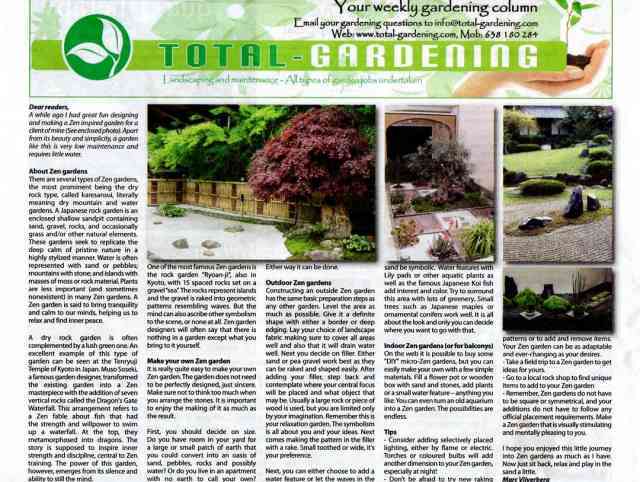 Constructing an outside Zen garden has the same basic preparation steps as any other garden. Level the area as much as possible. Give it a definite shape with either a border or deep edging. Lay your choice of landscape fabric making sure to cover all areas well and also that it will drain water well. Next you decide on filler. Either sand or pea gravel work best as they can be raked and shaped easily. After adding your filler, step back and contemplate where your central focus will be placed and what object that may be. Usually a large rock or piece of wood is used, but you are limited only by your imagination. Remember this is your relaxation garden. The symbolism is all about you and your ideas. Next comes making the pattern in the filler with a rake. Small toothed or wide, it's your preference. Next, you can either choose to add a water feature or let the waves in the sand be symbolic. Water features with Lily pads or other aquatic plants as well as the famous Japanese Koi fish add interest and color. Try to surround this area with lots of greenery. Small trees such as Japanese maples or ornamental conifers work well. It is all about the look and only you can decide where you want to go with that. Indoor Zen gardens (or for balconys) On the web it is possible to buy some "DIY" micro-Zen gardens, but you can easily make your own with a few simple materials. Fill a flower pot or wooden box with sand and stones, add plants or a small water feature � anything you like. You can even turn an old aquarium into a Zen garden. The possibilities are endless. - Consider adding selectively placed lighting, either by flame or electric. Torches or coloured bulbs will add another dimension to your Zen garden, especially at night! - Don�t be afraid to try new raking patterns or to add and remove items. Your Zen garden can be as adaptable and ever-changing as your desires. 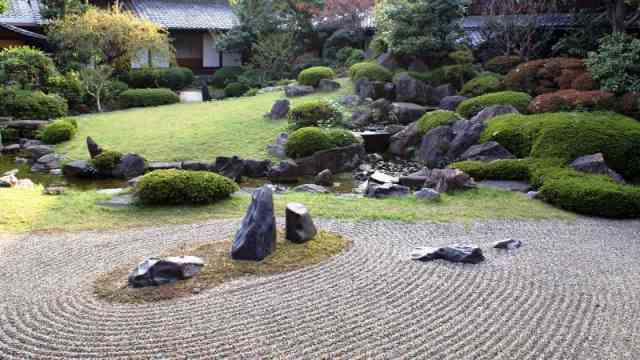 - Take a field trip to a Zen garden to get ideas for yours. - Go to a local rock shop to find unique items to add to your Zen garden - Remember, Zen gardens do not have to be square or symmetrical, and your additions do not have to follow any official placement requirements. 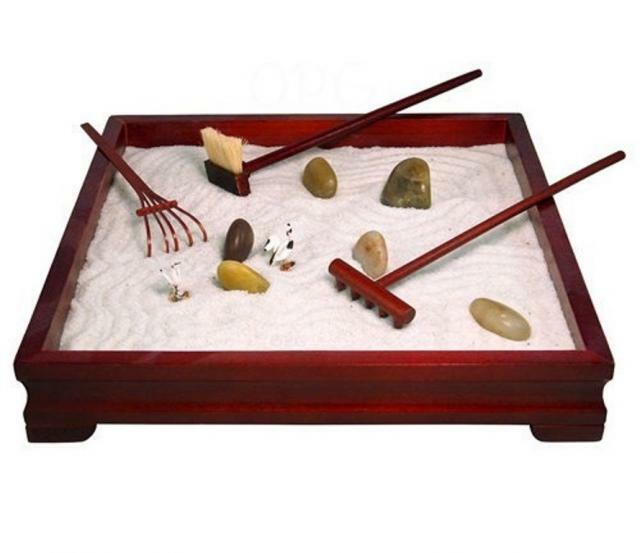 Make a Zen garden that is visually stimulating and mentally pleasing to you. I hope you enjoyed this little journey into Zen gardens as much as I have. Now just sit back, relax and play in the sand a little.